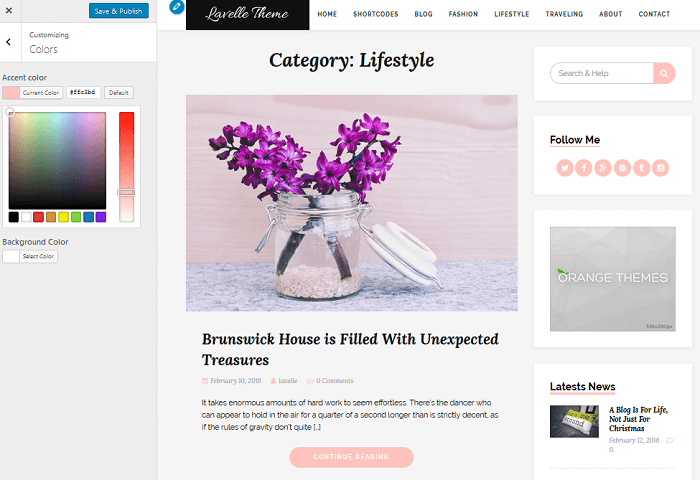 Lavelle is a feminine WordPress theme catering to those looking to start a beauty, fashion, or lifestyle website. 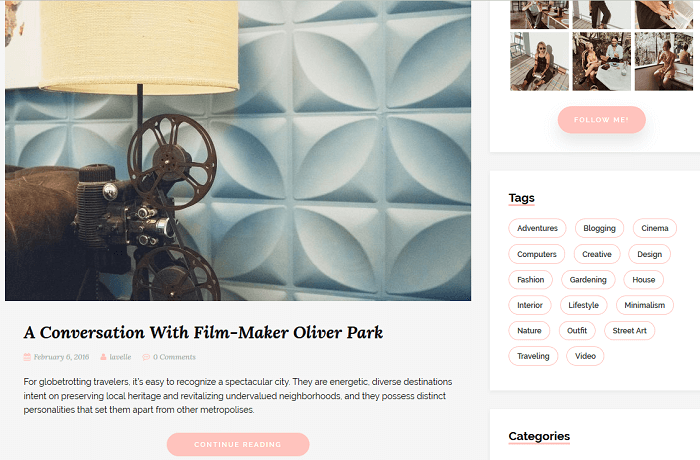 However, if you are looking for a softer looking theme, but have a different niche in mind, Lavelle’s versatility lends itself to a variety of different website types. Lavelle was created to give website owners a girly, yet professional looking platform that showcases your written content, images, and possibly your online shop. Easy Bootstrap Shortcode. Quickly add beautiful icons and buttons to your website using the tinyMCE editor. Add things such as button dropdowns, tabs, and badges to your sidebars and footer sections, as well as your site’s posts and pages. Orange Themes Custom Widgets. 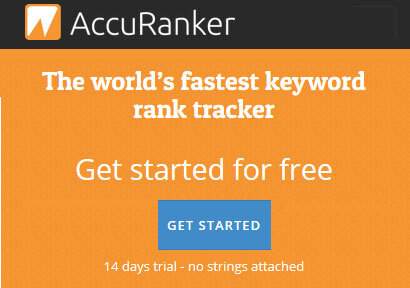 Take advantage of the Latest News, Social Links, About Blog Author, Feature, and Team plugins all bundled into one great plugin. These features, paired with Lavelle, make for an exciting and interactive website your site visitors will continue to frequent. WP Instagram Widget. If you are looking for a way to spice up your website using stunning imagery, this plugin is a great option. For instance, add your Instagram feed to your site’s sidebar so readers are always updated on what your feel are your best shots. In addition, Lavelle is compatible with popular caching plugins such as WP Super Cache and W3 Total Cache so that you can make sure your site visitors always experience the fastest loading pages. Lastly, when it comes to optimizing your site’s beautiful photographs, you can use plugins such as EWWW Image Optimizer or Smush It so that images load fast and your site’s performance is never sacrificed. Designed to reduce the clutter that so many feature-packed themes comes with, Lavelle aims to give you all the design and functionality you need to build a fully operating website that appeals to your target audience, without overwhelming the senses and turning people away. 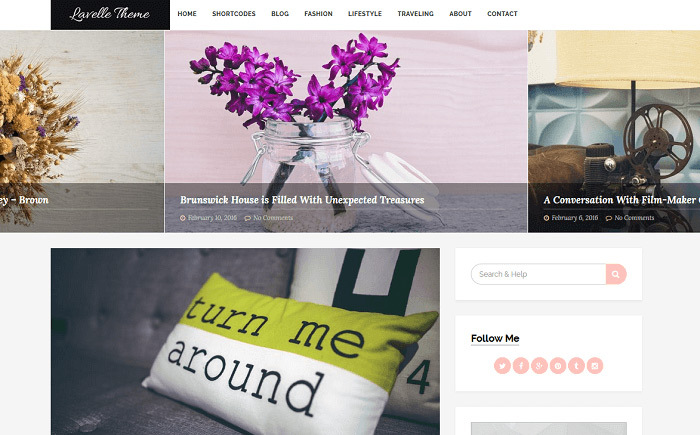 Girly, feminine, beautiful, or glamorous – no matter how you describe it – Lavelle has the standard features you would expect any high quality WordPress theme to have. Changing elements on your website is easy using Lavelle’s real-time Live Theme Customizer. Site Identity. A site title, tagline and custom logo is a great way to instill a sense of trust with readers and imprint brand recognition on anyone that visits your website. Plus, add copyright text in the footer if you want. Layout Options. Enable sidebars on the right or left side and add widgets such as Latest Posts, social share buttons, and even your Instagram feed. Not only can you configure the primary menu that displays at the top of your website, you can add footer menu items as well to encourage those on the way out to check out one last thing on your website. Static Front Page. 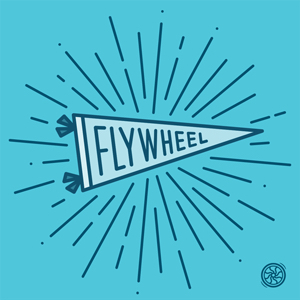 Use your homepage as a faux landing page, or share with readers your latest posts with a simple click of a button. Specify which category of posts you would like to highlight using Lavelle’s slider feature. Or, if you want to mix things up, include them all. In addition, let’s look at some of Lavelle’s best features. When it comes to feminine themes, colors make all the difference in the world. Luckily, Lavelle comes with an intuitive color picker that lets you choose the perfect palette for your girly website. Shades of pink, purple, and yellow are all achievable. Change the accent colors and background color and watch your website take on a softer, more delicate look instantly. Lavelle gives you an easy way to add a subtle (or not so subtle) background image to your website for added visual appeal. Use this feature to attract the attention of site visitors, and watch them continue to explore your entire website and engage with your killer content. Choose an image, determine its positioning, and even configure its size, all from the Live Theme Customizer. Plus, enable the background image to scroll down the page with your readers. Lavelle is minimal theme with widgetized sections in the sidebar only. However, this doesn’t mean Lavelle lacks when it comes to the widgets you can add. Add widgets such as the following: Categories, Pages, Latest Posts, RSS, Recent Comments, Search, Instagram Feed, Video, Social Media, and even a Tag Cloud. The options are limitless and can help you to build a full sidebar with plenty of information for your site visitors. If you want to impress site visitors the moment they click on your website, use Lavelle and display large featured images of all your best content. Complete with post title, tags, author, and post snippet, readers will know immediately whether they want to click on the “Continue Reading” button or not. 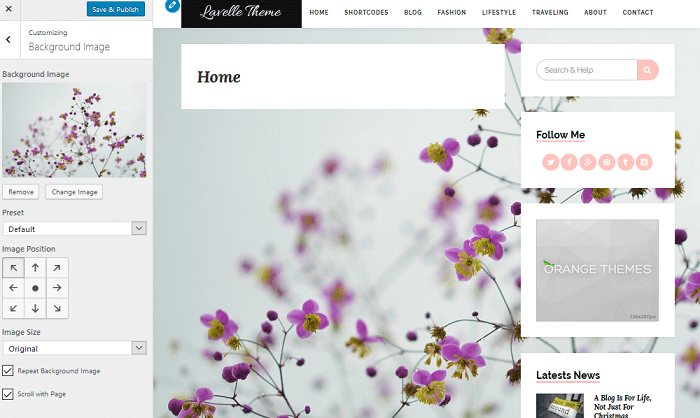 In the end, Lavelle is a great option for those that want a soft website with a touch of girly style. With its minimal feel, elegant design, and built-in functionality, Lavelle allows you to cater to those who love fashion, beauty, travel, and lifestyle topics. If you’ve finally found the theme you been looking for, you may also be interested to learn more about the WordPress hosting options. If so then we’ve create a dedicated page about the best managed WordPress hosting companies where we compare the main market leaders based on various criteria so make sure you check it out. That page is more of a guide to help you select the most reliable, fastest and trustworthy hosting provider.